The second edition of Digital Marketing Award honored 78 digital campaigns through a grand award gala on Saturday. An initiative of Bangladesh Brand Forum, Digital Marketing Award 2018 was presented by Meghna Group of Industries. The award gala was attended by 500 digital marketing enthusiasts. The awards were given across 16 categories, in three ranks – Grand Prix, Gold and Silver. The event was powered by Content Matters and was organized in association with The Daily Star. 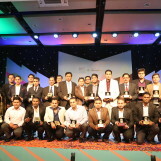 Digital Marketing Award is the only accolade for digital works in Bangladesh. This year, a total of 456 nominations were submitted for the award. Four jury panels shortlisted 202 works and another four jury panels selected the ultimate 78 winners. There were 16 Grand Prix awards, 39 Gold awards, and 23 Silver awards. Grand Prix for the Best Integrated Digital Campaign was won by Analyzen & Mindshare for their campaign Lux Super Star 2018. This campaign also won two more golds in separate categories. The highest number of awards, 4 gold, for a single campaign were won by X, for their campaign Robi Bijoy Itihash. Furthermore, Coca-Cola Nikhoj Shobder Khoje by Grey Advertising Bangladesh won three gold awards, second highest for a single campaign, along with Lux Super Star 2018. The highest number of awards by a single agency were won by Analyzen. They won 15 award individually and 3 more awards jointly with Mindshare. Digital Marketing Award 2018 was preceded by 5th Digital Marketing Summit. Initiated in 2014 by Bangladesh Brand Forum, the Digital Marketing Summit is the apex platform for country’s digital marketers. This year’s summit which was attended by around 400 professionals. Theme for the summit was ‘Delving Deep into Digital’. The fifth edition had 5 global speakers, who came from different regions of the world and shared knowledge. Alongside, there were 22 local experts who discussed on multiple topics. Multiple panel discussions, breakouts, insights and many more engagements gave the summit premises a school-like ambience. Experts discussed on how to use data to craft digital marketing strategy, how to prepare digital ad budget, communicate responsibly with digital consumers and much more.